Anya Sushko Handbags London is luxury handbag brand founded in 2008 by bespoke leather accessories specialist, Central St Martin’s graduate and former Alexander McQueen couture assistant, Anya Sushko. Quality and craftsmanship are the hallmarks of the brand, and Anya is passionate about creating unique statement handbags which are beautiful but also practical and a pleasure to wear and touch. Each Anya Sushko handbag combines traditional crafting techniques with distinctive and modern designs. Each is practical whilst retaining elegance and style. Designed and handmade in the company’s London atelier from the finest Italian leathers, with hand-stitched finishing, Anya Sushko handbags are made to stand the test of time in every way. Anya has designed bespoke collections for the Dorchester Hotel boutique in London and the Esse Purse Museum in the United States amongst others, and is currently showcasing her collections at the Royal Automobile Club and the Chester Grosvenor Hotel. She produces bespoke items on individual as well as collection basis. Personalised details can be added to any item, no matter how big or small. Keeping true to her brand’s ethos, Anya is involved in the entire creation process – from idea conception to the last finishing touches of every bag. The handbags stand out for their quality, striking shapes and carefully-placed details, and are designed to be as practical as they are beautiful, and always wonderful to the touch. The quality can be felt as well as seen. “It is important that my handbags are not only unique and special, but also practical. I design for women with busy and demanding lives, to whom elegance is important”, Anya Sushko. Anya recently launched her Berry Accessories line, which is her first collection of small affordable leather items. Born in Riga, Latvia, when it was still part of the USSR, Anya’s childhood was marked by the typical Soviet challenges: no access to foreign goods and limited exposure to Western culture. Anya compensated for this, like a lot of Russians, by involving herself vigorously in classical Russian arts such as ballet, gymnastics, piano-playing and fine art. From an early age, with the encouragement of her mother, Anya also learnt to make herself beautiful clothes and accessories. Her creative flair led her to study architecture and then interior design in Riga. Later, she was talent-spotted by the Central Saint Martins’s College of Art and Design in London, and after graduating from there she undertook a degree in Product Design Development for Leather Accessories at the London College of Fashion. After completion of her studies, Anya furthered her skills at Alexander McQueen’s studio in London, where she worked on the Couture Collections presented during Paris Fashion Week 2006. Anya set up her own company and luxury handbag brand in 2008 and exhibited her first collection, ‘Chic & Shape’, at Paris Fashion Week in 2009 following which she was named in trade press as ‘a trend setter’. 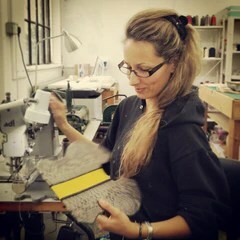 Anya spends most of her days in her London studio along with her hand-picked team of talented designers and leather specialists. You can view more about life behind-the-scenes on Anya’s Instagram. In addition to working on her own brand, Anya is also very passionate about working with other independent designers and is actively involved in the development and creations of other brands’ collections. Designers that Anya has worked with include Jane Tylor, Mawi, Amelia Powers, AV Studios including Ralph and Russo, Mulberry, Thomas Lyte, Henry Holland and others. Anya has been recognised in international designer awards, most recently in the “101 Handbag Designer Award 2014” in New York. She is regularly featured in Fashion trade and consumer press and blogs around the world. Collezioni Accessori described her handbags as “complicated structures made of the finest materials and finished with meticulous detailing, each with a tale to tell and a gift for transmitting for deep down desires”. You can click here to read more press coverage.